Chicken pie with our classic rosemary white sauce, yummy! I’ve been making meals for the freezer this week for after the baby’s birth (I’m getting close!) 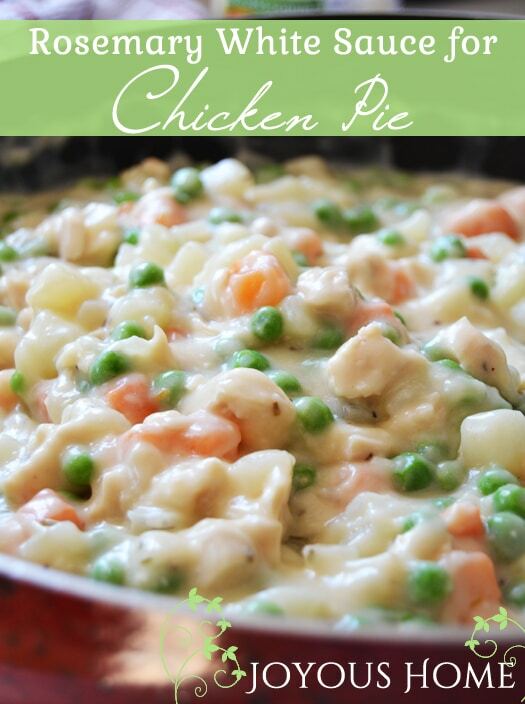 Homemade chicken pie with our special rosemary white sauce has always been a freezer meal for a baby’s birth in my family. Pineapple upside down cake is another special after-baby-comes food, or dessert. It’s funny how certain foods and events always go hand in hand. So many sweet memories attached to them too. 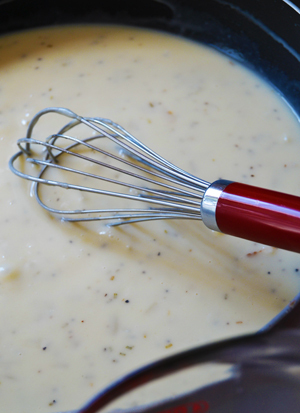 So, I’d like to share our family’s recipe for rosemary white sauce for chicken pie. 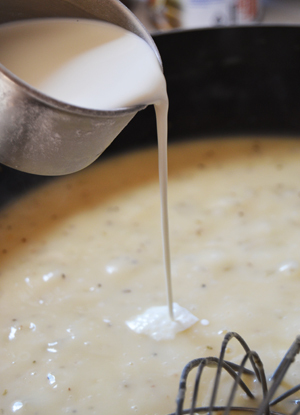 This is probably the most important part of chicken pie… let me encourage you never ruin a chicken pie with a can of cream of mushroom soup. It’s just not the same! 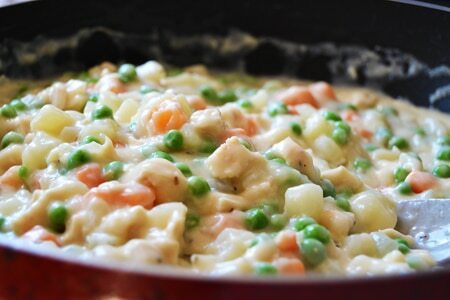 This recipe makes enough sauce for one 9″ x 13″ casserole-sized chicken pie – enough for 3 chicken medium-size chicken breasts plus vegetables. Double or triple as necessary for your family. All of these steps are done over medium heat. Not high heat, slow is the key! 1. 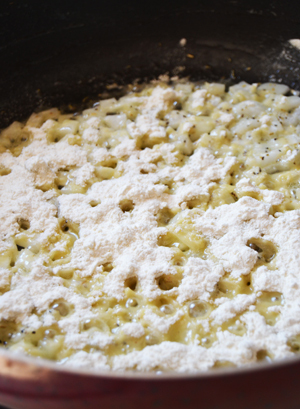 Melt 1/2 cup butter in a large skillet. Add 1 large chopped onion. Sprinkle with 1/2 tsp. crushed dried rosemary or 1 tsp. fresh rosemary (fresh rosemary is wonderful!) finely chopped and 1/2 tsp. ground black pepper. 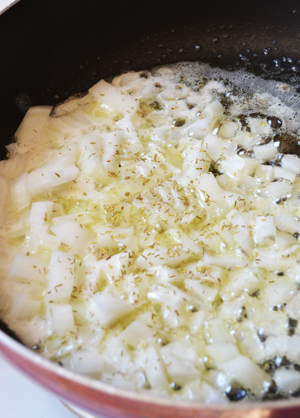 Saute` until onion is tender. 2. Sprinkle with 1/3 cup unbleached white flour or soft wheat flour (both flours work well, but white flour will produce a smoother sauce). Whisk in and cook for about 1 minute, until the flour has started to brown just a tad. 3. Now slowly pour in 2 cups of chicken broth while whisking. 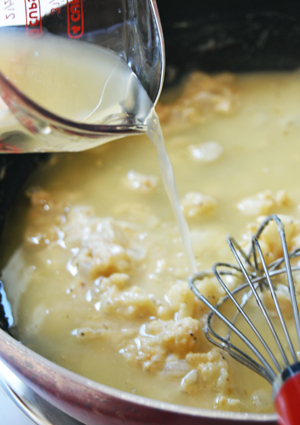 Whisk and cook until smooth. 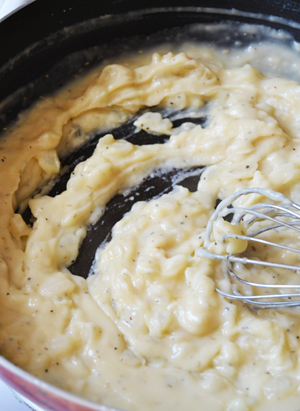 The sauce will have a “mashed potato” look to it at first… just keep pouring in your chicken broth and whisking. 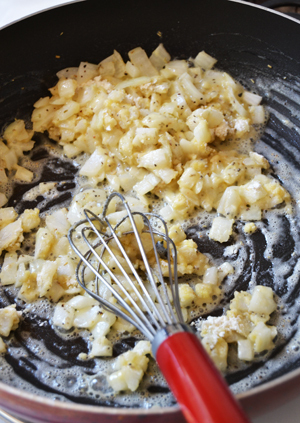 Whisk until smooth and continue to cook and stir for 1-2 minutes. Remove from heat. Taste and season with sea salt and perhaps a little more pepper. Add your chicken pie fillings. 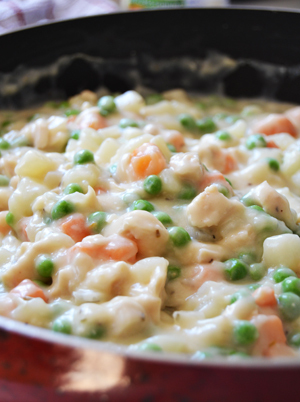 I typically use peas, carrots, potatoes (carrots and potatoes need to be steamed first) and of course, cooked chopped or shredded chicken. ~ Use either homemade or canned chicken broth, not bouillon… Yes, there is a huge difference! ~ Don’t be afraid of heavy whipping cream and half & half. Milk is great, but cream is greater. Live a little and use the cream. Again, this makes a huge difference. ~ Make your own pie crust, and make it with butter! I will be sharing our basic buttery pie crust as soon as I get some peaches to put in the crust when I’m done showing you how to make it.